So, it's truth time: Lucille has had more parties than Gus. But parties are also more important to her. She loves having friends over to play and eat cake and enjoy each others company. Last year we stayed at the Railroad Park Resort in Dunsmuir for Gus' birthday. When I asked him about this year if he wanted to go back there or have a big party - he picked the sleeping in a train. Not a big surprise. When I asked Lucille if she wanted a party or a vacation - she picked a party. So it is what it is. I find the easiest way to send out invitations is via email and the people at Paperless Post have it all figured out. Their designs are lovely and they organize who is coming and who isn't so easily. Plus if you wanted to - you can have them mail a real invite. When they asked if I'd do a review of their service in exchange for some free credit - I happily accepted. 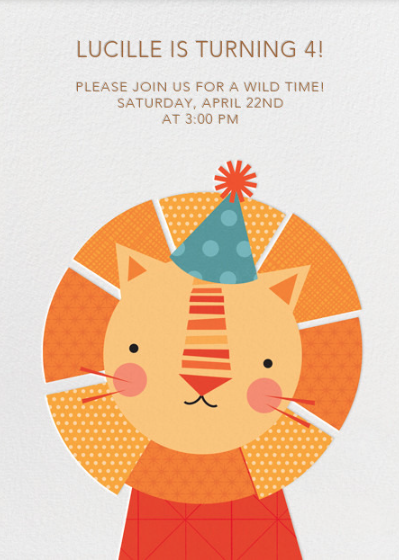 Lucille has a bit of a lion obsession and she really wanted that to be the theme of her recent party so I went with it and found the adorable invite above. What makes Paperless Post easy for me? The tracking is great and so is the messages and response set up. It's all behind the scenes and doesn't clutter up your invite - which in turn looks like an actual invite, not a web page. The designs they offer are awesome and I love the beautiful Thank You cards you can send too. Oh, and birthday cards! You can even schedule in advance in case your life is as hectic as mine. Right now they have some lovely designs from Kate Spade and Rifle Paper Co. both totally worth checking out. My experience with Paperless Post has been amazing - and I'd most definitely recommend it.